July 20, 2003 – NWA TNA Xplosion: Ron Killings & B.G. James & Konnan defeated Nate Webb & Dirk Cigler & Mad Man Pondo..
August 6, 2003 – NWA TNA Xplosion: 3-Live Krew defeated Nate Spyder Webb & Chris Hero & Scotty Matthews..
October 23, 2003 – IWA: Mid South: Alex Shelley defeated Nate Webb..
October 29, 2003 – NWA^TNA: AJ Styles defeated Nate Webb in a match taped for TNA’s Xplosion TV program..
November 15 2003 – NWA TNA Xplosion: Ron Killings & B.G. James & Konnan beat Johnny Curtis & Jarod Steele & Nate Webb..
November 21, 2003 – IWA: Mid South: JC Baily defeated Sonjay Dutt & Nate Webb in a TLC 3-way to retain the LHW title..
November 27, 2003 – IWA: Mid South: Ian & Axl Rotten defeated JC Baily & “Spyder” Nate Webb..
January 16, 2004–IWA Mid South Wrestling: Matt Sydal beat Nate Webb..
February 13, 2004–IWA Mid South Wrestling: Sabu won three-way over J.C. Bailey and Nate Webb..
March 6, 2004 – IWA Mid South Wrestling: Nate Webb defeated J.C. Bailey in death match..
April 3, 2004 – NWA TNA Xplosion: Jerry Lynn & Elix Skipper & Sonjay Dutt defeated Nate Webb & Johnny Curtis & The Mayor..
April 17, 2004 – NWA TNA Xplosion: Jerry Lynn & Elix Skipper defeated Nate Webb & Chris Hero..
May 29, 2004–IWA Mid South: Nate Webb participated in a 7-man elimination style match for #1 Contendership..
~~~Petey Williams beat Jimmy Jacobs & Alex Shelley & Roderick Strong & Nate Webb & Austin Aries & Delirious..
June 12, 2004 – CZW: Nate Webb won a Trifecta Elimination Tournament to gain entry into next months Best of the Best! ~~~Nate Webb defeated Jigsaw and Excalibur (first round), then defeated Mikey Tenderfoot and Jay Fury (finals)..
June 25, 2004–IWA Mid South King of the Death Match: Ian Rotten beat Nate Webb in “fans bring the weapons” match..
June 26, 2004 – NWA TNA Xplosion: Petey Williams & Bobby Rude & Eric Young beat Nate Webb & Danny Daniels & Ryan Boz..
July 10, 2004 – CZW BotB 4: Petey Williams & Sonjay Dutt eliminated Nate Webb in the first round! 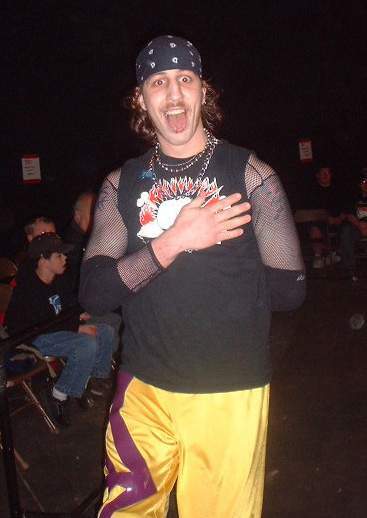 July 31, 2004–IWA Mid South: Jimmy Jacobs beat Mark Wolf and Nate Webb in a 3-WAY to win an Light Heavyweight title shot..
August 7, 2004 – NWA TNA Xplosion: Christopher Daniels & Elix Skipper defeated Nate Webb & Eric Darkstorm..
August 13, 2004–Buckeye Pro Wrestling: B.J. Whitmer won a gauntlet over Matt Stryker, Ala Hussein and Nate Webb..
August 14, 2004 – CZW: Bobby Quance defeated Jay Lethal and Arik Cannon and Nate Webb (sub for Roderick Strong)..
September 4, 2004 – NWA TNA Xplosion: Monty Brown defeated Nate Webb & Eddie Venum in a Handicap match..
September 11, 2004 – NWA TNA Xplosion: Ron Killings & B.G. James & Konnan defeated Nate Webb & Sebastian & J.D. Escalade..
September 11, 2004 – CZW Night Show: Chri$ Ca$h defeated Nate Webb and JC Bailey in a HIGH STAKES 3-WAY LADDER match..
September 15, 2004–IWA Mid South: Nate Webb defeated B-Boy..
September 17, 2004–IWA Mid South: Nate Webb defeated Hallowicked..
October 2, 2004–NWA Revolution: Nate Webb defeated Danny Daniels..
October 15, 2004 – TNA Xplosion: Abyss defeated “Spider” Nate Webb..
October 20, 2004–IWA Mid South: Abyss defeated Spyder Nate Webb..
October 22, 2004–IWA Mid South: Chris Sabin defeated Spyder Nate Webb..
October 23, 2004–IWA Mid South: Roderick Strong & Austin Aries & Nigel McGuinness beat Samoa Joe & Ace Steel & Nate Webb..
November 12, 2004–Buckeye Pro Wrestling: Shark Boy & Nate Webb defeated Abyss & Evil Shark Boy in a tables match..
November 14, 2004 – CZW: Ruckus & Sabian & Maven Bentley & Eddy Kingston b Joker & Chris Cash & JC Bailey & Nate Webb..
November 19, 2004–IWA Mid South: Nate Webb & Matt Sydal defeated Petey Williams & Delirious..
November 20, 2004–IWA Mid South: Matt Sydal won three-way over Nate Webb and B-Boy to win the Midwest Heavyweight title..
November 13, 2004–International Wrestling Cartel: Nate Webb defeated Sterling James Keenan..
December 11, 2004 – CZW: Team Ca$h defeated Team Blackout in a Cage of Death (War Games) match to win the Tag Team titles! 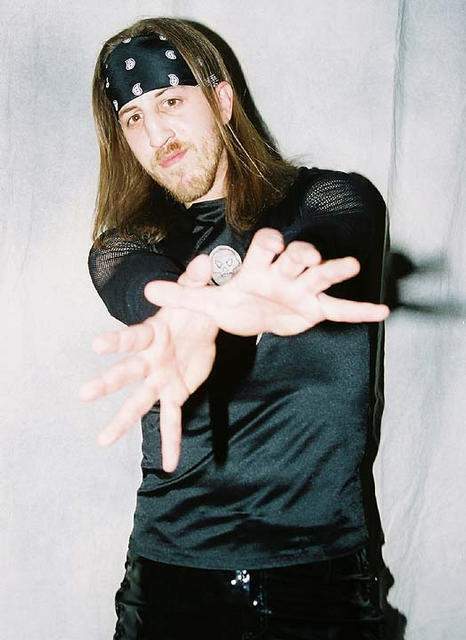 ~~~Team Ca$h: Chri$ Ca$h, JC Bailey, Nate Webb, & Sexxxy Eddy | Team Blackout: Ruckus, Sabian, Eddie Kingston & Jack Evans..
December 17, 2004–IWA Mid South: Nate Webb defeated Chris Hero in a 33:00 match..
February 5, 2005 – CZW: H8 Club (Nick Gage & Justice Pain) defeated Nate Webb & Chri$ Ca$h to win the Tag Team titles! ~~~JC Bailey turned on Team Ca$h over not having been chosen to defend the titles since they won it at COD6..
February 12, 2005–IWA Mid South: Spyder Nate Webb defeated Ken Westbrooks..
February 18, 2005–New Breed Wrestling Association: Shark Boy defeated “Spyder” Nate Webb..
March 12, 2005 – CZW: B-Boy & Spyder Nate Webb (Mystery Partner) defeated Chris Hero & Claudio Castagnoli..
April 9, 2005–International Wrestling Cartel: Sterling James Keenan beat “Spyder” Nate Webb to retain the Super Indy title..
April 23, 2005–IWA Mid South/NWA No Limits: Josh Abercrombie beat Tyler Black & Nate Webb & Chandler McClure in a 4-WAY..
May 14, 2005 – CZW Best of the Best: Ebessan defeated Nate Webb in the FIRST around of the BOTB Tournament..
~~~~Later on in a Tag Team match: Sexxxy Eddy & Spyder Nate Webb defeated Blackout (Ruckus & Eddie Kingston)..
June 4, 2005–NWA Midwest: Chad Allegra vs Nate Webb vs Ryan Stone vs 5 Star (Allegra & Webb ended in a draw)..
June 11, 2005–IWA Mid South: Axl & Ian Rotten & Nate Webb defeated JC Bailey & Mad Man Pondo & Toby Klein..
June 11, 2005 – CZW: Nate Webb defeated J.C. Bailey in a Tables/Ladders/Chairs match..
June 17, 2005–IWA Mid South: Nate Webb defeated Marek Brave..
June 18, 2005–IWA Mid South: Marek Brave defeated Nate Webb..
July 1, 2005–IWA Mid South: Spyder Nate Webb defeated Chandler McClure..
July 9, 2005 – CZW: Blackout (Ruckus & Sabian & Eddie Kingston) defeated Sexxxy Eddy & Nate Webb & B-Boy..
July 26, 2005–Buckeye Pro Wrestling: Abyss & Shark Boy & Nate Webb beat Cody Hawk & The Shooting Stars..
July 30, 2005 – CZW: Nick Gage defeated Nate Webb in the first round of the Tournament of Death..
August 13, 2005 – CZW: Nate Webb (IWA Mid-South) defeated B-Boy in a loser leaves town match..
September 10, 2005 – CZW Chri$ Ca$h: Ruckus & Derek Frazier defeated Niles Young & Nate Webb in a 4-WAY Ladder match..
September 10, 2005 – CZW: Kevin Steen defeated Nate Webb to retain the Iron Man title..
September 23, 2005–IWA Mid South: Kevin Steen defeated “Spyder” Nate Webb in the 1st round of the Ted Petty Invitational..
September 24, 2005–IWA Mid South: Super Dragon was the last remaining survivor in an 8-Man Elimination match…. ~~~Super Dragon & Alex Shelley & Joey Ryan & Claudio Castagnoli beat Brandon Thomaselli & Nate Webb & El Generico & Puma..
October 8, 2005 – CZW: Voltaire w/Pandora defeated “Spyder” Nate Webb..
October 15, 2005–IWA Mid South: Brandon Thomaselli defeated Spyder Nate Webb..
October 29, 2005–International Wrestling Cartel: Mickey & Marshall Gambino defeated Tracy Smothers & Nate Webb..
November 12, 2005 – CZW: Niles Young defeated Spyder Nate Webb in a #1 Contenders match for the Junior title..
February 11, 2006 – Combat Zone Wrestling: Adam Flash w/Pandora defeated “Spyder” Nate Webb…..
March 25, 2006–AAW: Jimmy Jacobs defeated Spyder Nate Webb..
April 28, 2006 – Ring of Honor: Team CZW defeated Team ROH in a match when Claudio Castagnoli pinned BJ Whitmer..
~~~~~~~~~Team Combat Zone Wrestling (Necro Butcher & Super Dragon & Nate Webb & Claudio Castagnoli)..
~~~~~~~~~Team Ring of Honor (Samoa Joe & Adam Pearce & Ace Steel & Colt Cabana & BJ Whitmer)..
April 29, 2006 – ROH: Samoa Joe defeated Claudio Castagnoli by DQ when CZW’s Nate Webb & Necro Butcher interfered! June 24, 2006 – ROH: Claudio Castagnoli & Necro Butcher & Nate Webb beat Adam Pearce & Ace Steel & BJ Whitmer..
July 14, 2006–Juggalo Championshit Wrestling: Big Chuck Wagon defeated Spyder Nate Webb…. July 15, 2006 – ROH: Team Ring of Honor defeated Team Combat Zone Wrestling in a 5-on-5 Cage of Death match..
~~~Team Ring of Honor: Samoa Joe, Adam Pearce, BJ Whitmer, Ace Steel, and American Dragon w/Jim Cornette & JJ Dillon..
~~~Team Combat Zone Wrestling: Chris Hero, Necro Butcher, Spyder Nate Webb, Claudio Castagnoli, and Eddie Kingston..
Spyder Nate Webb formed a tag team with Josh Abercrombie called “The Trailor Park Boys” in Wrestling Society X..
November 11, 2006–WSX (TV Taping): The Trailor Park Boys (Webb/Abercrombie) defeated Jimmy Jacobs & Tyler Black..
November 12, 2006–WSX (TV Taping): The Filth & The Fury (Teddy Hart & M-Dogg20) defeated The Trailer Park Boys..
November 14, 2006–WSX (TV Taping #1): Kaos & Aaron Aguilera beat The Trailor Park Boys (Nate Webb & Josh Abercrombie)..
November 14, 2006–WSX (TV Taping #2): The Trailer Park Boys (Webb & Abercrombie) defeated Luke Hawx & Alkatrazz..
February 9, 2007–IWA Mid South: Ricochet beat Jack Thriller & Marcus O’Neal & OMG & Zach McGuire & Nate Webb in a 6-WAY..
February 13, 2007–MTV Wrestling Society X (Taped 11/06): Teddy Hart & Matt Cross defeated Nate Webb & Josh Raymond ..
April 14, 2007–IWA Mid South: C.J. 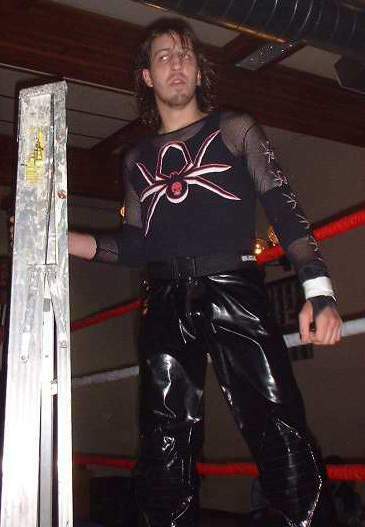 Otis defeated Spyder Nate Webb in Shelbyville, Indiana..
May 19, 2007–Pro Wrestling Guerrilla: Ricky Reyes & Rocky Romero beat Nate Webb & Josh Abercrombie in a 1st Round match..
July 22, 2007–IWA Mid South: Chuck Taylor defeated Nate Webb to retain the IWA-MS World Heavyweight title..
August 4, 2007–Insanity Pro Wrestling: Scotty Vortekz defeated Nate Webb to retain the Junior Heavyweight title..
August 4, 2007–IWA MS: Nate Webb beat Haymee & Skyline & Detox & D.Moore & Vortekz & xOMGx & B.Roc in an 8-WAY. 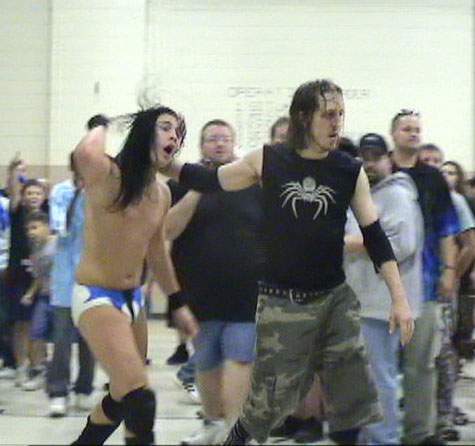 August 5, 2007–IWA Mid South: JEWW (C.J. Otis & Ash) beat The Trailer Park Boys (Nate Webb & Josh Abercrombie), ..
August 31, 2007–IWA Mid South: The Trailer Park Boyz defeated Milwaukee’s Finest (Silas Young & Dysfunction) .. ..
September 7, 2007–IWA Mid South: Spyder Nate Webb defeated Tracy Smothers in Plainfield, Indiana..
October 9, 2007–XCW Midwest: JC Bailey vs. JC Ice vs. Nate Webb ended in a NO CONTEST in New Albany, Indiana..
March 13, 2009 – Ring of Honor: Spyder Nate Webb defeated Flash Flanagan in a singles match..
September 18, 2010–Insanity Pro Wrestling: Nate Webb defeated Clifton Crunk in Indianapolis, Indiana..